Becoming a Christian in name only is truly very easy. The hard part comes when you try to live the life of a believer. I’ve learned from my own struggles that, at times, it is difficult to stay on the straight and narrow path. If the world isn’t working to entice me back into a sinful lifestyle, my own flesh is doing its best to corrupt my morals. 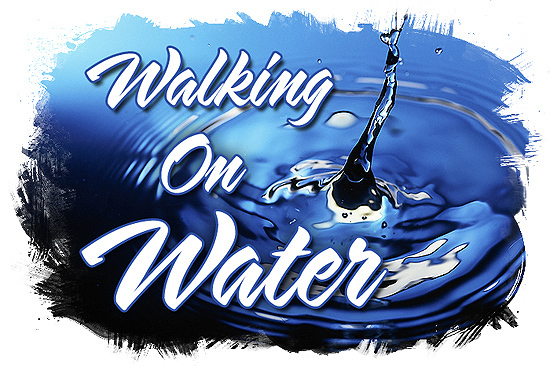 Many times, resisting sin seems as difficult as walking on water. I’m sure many people would be happy to just keep their heads above the water line. The best way to improve your Christian walk is to first admit you have problems in certain areas. Two of the greatest impediments found throughout Christianity are the lack of sincerity and the inability to confess personal faults. “Confess your faults one to another, and pray one for another, that ye may be healed. The effectual fervent prayer of a righteous man availeth much”(James 5:16 KJV). “Bear ye one another’s burdens, and so fulfill the law of Christ. For if a man think himself to be something, when he is nothing, he deceiveth himself” (Gal. 6:2-3). Christian Leaders on DrugsWhen it comes to fulfilling our role in society, much of our guidance comes from the people we highly regard. Our birth parents are normally the first role models we encounter. They teach us how to walk, talk, and interact in our social environment. Christianity has role models too. Some very good heroes of the faith are found in the Bible. But when I try to think of living examples of people I’d want to emulate, I must say, I come up short-handed. From my many years of observation, I have found that many Christian leaders seem at times like they’re high on drugs. They display poor judgment, they talk in the same manner as someone whose mind is impaired, and they often seem numb to the trials the average Christian encounters in daily life. For some reason, they just simply don’t act like normal people. I never have understood why so many preachers like to wear $3,000 suits, drive BMWs and live in multi-million dollar homes. I’ve always believed the word “minister” implies modest living. I’m not saying all ministers should be required to take a vow of poverty; however, I do think they should be required to take a vow against extravagance. During the Bakker/PTL scandal, Tammy Bakker became a poster child for gaudy make-up. It surprises me greatly to see women following in Tammy’s footsteps. Right now I have in mind one individual who currently reigns as the queen of charismatic television. As much make-up as she wears, you would think she buys it by the pound. “In like manner also, that women adorn themselves in modest apparel, with shamefacedness and sobriety; not with braided hair, or gold, or pearls, or costly array; but (which becometh women professing godliness) with good works” (1 Tim. 2:9-10). Whenever a prominent leader falls prey to a major sin, the public tends to highlight his moral failing. When people point to him and say, “He’s just like us,” they are 100 percent correct. Even the most seemingly righteous person has to constantly guard against some of the most basic temptations. Every day, countless people who have tried to follow the Christian way of life give up because they don’t think they can measure up to the standards found in the Bible. Some folks believe God endows a select number of people with the power to live sin free. Because sin is still present in their lives, they feel they’re not members of that special group. For the good that I would I do not: but the evil which I would not, that I do… O wretched man that I am! who shall deliver me from the body of this death? (Rom. 7:19 and 24). I’m not trying to say sin doesn’t matter. The Bible plainly says we need to meet certain, minimal requirements in order to qualify for God’s grace. The contradiction of our inability to meet those standards is resolved by the fact we are, with God’s help, striving to reach the state of perfection. “Not every one that saith unto me, Lord, Lord, shall enter into the kingdom of heaven; but he that doeth the will of my Father which is in heaven” (Mat. 7:21). Quite often our relationship with God is directly affected by how the world treats us. It would be so wonderful if life was one, long continuation of a Frank Capra movie, but unfortunately, none of us lives in the land of “happily-ever-after.” When things are going well, we think God loves us. When things turn sour, we conclude that God doesn’t love us anymore. My own mother would ride this roller coaster up and down all the time. During cheerful times, she’d be singing hymns of praise, telling me how the Lord had blessed our family. During times of stress, she seemed to assume God and the devil had joined forces to make her life miserable. I’m not going to just hang dear, old mom out to dry. I, too, have found myself on this cycle of loving God when things are going my way, and getting discouraged with Him when trouble comes. My fault has always been that I see God as the one pulling the strings in all situations. Unless we’re able to deify fictional characters like Santa Claus and the Tooth Fairy, we’re not going to have a supreme being who only doles out the goodies. What kind of relationship would we have with God if our love is solely based on things going our way? “That the God of our Lord Jesus Christ, the Father of glory, may give unto you the spirit of wisdom and revelation in the knowledge of him: The eyes of your understanding being enlightened; that ye may know what is the hope of his calling, and what the riches of the glory of his inheritance in the saints” (Eph. 1:17-18). The most common confession you’ll hear the average pastor make is the deep, dark sin of not loving God enough. Oh boy, my middle name is guilty when it comes to not giving God my all. Of course, in my case you’d also have to add a little bit of all of the seven deadly sins: wrath, gluttony, sloth, pride, lust, greed, and envy. The odd thing about me is that I’m generally a moral hermit. I’m always at home working on my computer, so I don’t normally experience the same types of trials most people face each day. Because of the intense heat, we drank gallon after gallon of bottled water. On top of the refrigerator was a big butcher knife that we used to open the cardboard boxes the water came in. To this very day, I remember looking at Sylvia’s head and that butcher knife and thinking, “That knife would look really good sticking out of her noggin.” Somehow, I survived Silvia and somehow she unknowingly survived me. I always cringe when people say they’ve reached the point at which they never feel tempted. A common term describes this type of person: “liar.” Everyone with a pulse has to deal with temptation. It doesn’t matter whether you’re the president, the pope, or a pauper; we all daily battle with the flesh. “I have been crucified with Christ; nevertheless, I live. Yet not I, but Christ lives in me. And the life I now live in the flesh, I live by the faith of the Son of God” (Gal. 2:20). One time I was going downtown, and as I started the car, I noticed a common housefly on the windshield. I thought as soon as the car began to move the fly would be gone. To my surprise, the fly remained motionless as I backed out of the driveway. Even after I had driven several blocks at about 25 mph, the fly was holding fast. I knew that it would eventually lose its grip on the smooth surface of my windshield. It wasn’t until the car accelerated to 30 mph that the onrushing air was too much for the fly to manage. People are swept away because they’re not clinging to anything sturdy. I love maintaining Rapture Ready, at times the process can become taxing. Because I know Jesus can come at any moment, I keep on keeping on. The imminence of Christ’s return is my foundation. “For we must all appear before the judgment seat of Christ; that every one may receive the things done in his body, according to that he hath done, whether it be good or bad. Knowing therefore the terror of the Lord, we persuade men” (2 Cor. 5:10-11). I’ve always envisioned the race for Heaven as being just that–a race. I strongly believe that everyone who runs vigorously for the prize will win handily; everyone walking briskly will also easily win; and everyone heading in the right general direction will likely win. I believe many people who are crawling towards the finish line will also receive a blue ribbon. Spiritual maturity is best described as people realizing they have more wealth in Heaven than they do here on earth. If a person realizes he has a mansion awaiting in glory, he would be less likely to fret about a leaky roof in his earthly home. If your sickly, 98-year-old grandfather were planning on leaving you his $10-million fortune, I doubt you’d be discouraged if you didn’t get that 25-cents-an-hour raise.